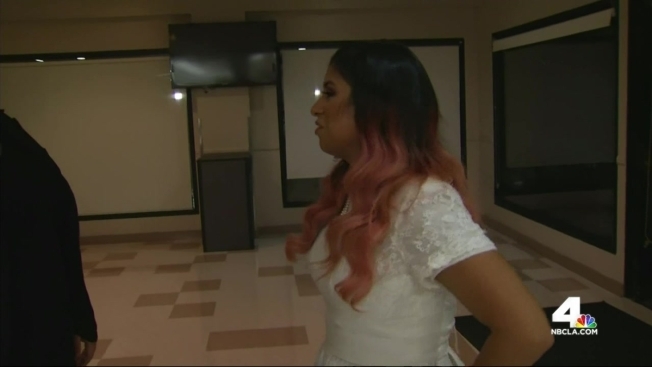 A bride, celebrating one of the most important days of her life, was notified right after walking down the aisle that all wedding guests needed to evacuate because of a brush fire that had broken out near the ceremony, officials confirmed. "Everyone was trying to keep me calm, so no one told me about the fire," Jennifer Greenwald, the bride, said. "I was so concentrated on [my future husband] I didn't see it." Jennifer and Russell Greenwald told NBC4 that as soon they said "I do" everyone had to vacate the area and find a new place for the reception. "Me and my groomsmen noticed smoke in the background and we thought, 'Oh, someone's barbecue must have gotten a little out of control,'" Russell said. The smoky smell in the air was something much worse - a 40-acre fire consuming dry brush in the Santa Ana riverbed right next to Fairmount Park where they were exchanging vows. "I saw flames out of the corner of my eye when the bride was coming down the aisle," Marie Burnsholzer, the pastor, said. Jennifer's wedding coordinator delivered the bad news to the oblivious bride. "My lovely coordinator said, 'I need to talk to you,'" Greenwald said. "And that's when she said, 'We need to evacuate now.'" The reception was also supposed to take place in the park, but officials said no way. "We took what we could to Reid Park, and I think it turned out better than we expected," Laura McAllister, wedding coordinator, said. The fire began making its way closer to homes around 6 p.m., though no residents had yet been evacuated. At 11:20 p.m., the fire was 100 percent contained, according to the City of Riverside Fire Department. Fire units were providing structure protection after aerial defense ended due to darkness from nightfall. No injuries were reported. "I think what kept us afloat is thinking this is a great story to tell our children," Jennifer said. "We like to think our love burns so bright we lit the park on fire."